Jason Gertelmen shares his experience from his shoulder surgery at Manhattan Orthopedic Care. The feeling of freedom and life without any pain or movement constraints. We were honored to witness such a moment after Jason Gertelmen had his shoulder surgery. When he visited Manhattan Orthopedic Care he was in serious pain because of the triple laberal tears in his shoulder. This kind of shoulder injury is very painful and could be very dangerous if not addressed properly and timely. Like in Jason’s case, most of the time this injury is repaired with a shoulder surgery. “Jason is a lucky guy. 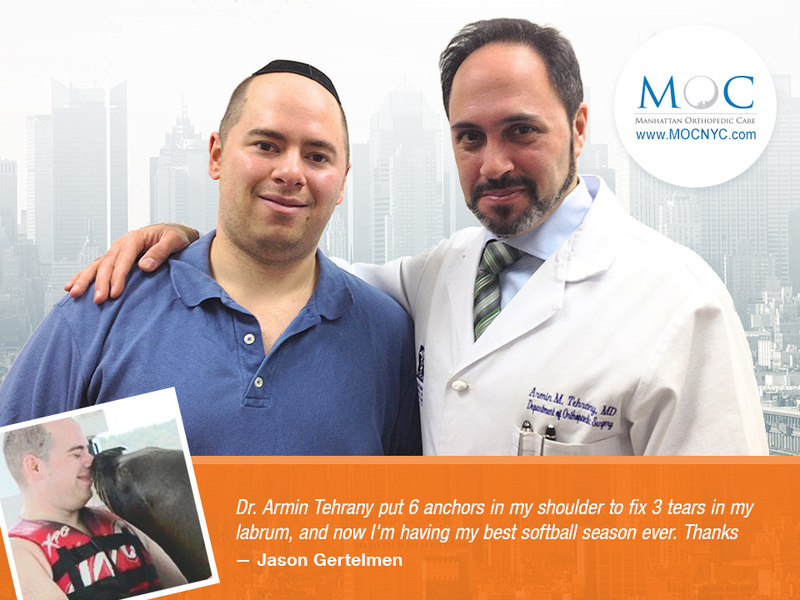 He came to a team of professionals who knew exactly what to do and helped him to get his shoulder back to health!”, says MOC’s shoulder specialist Dr. Armin Tehrany. Mr. Gertelman is now fully recovered. He went through a complete program of shoulder recovery, which helped him start feeling better much sooner than he expected. “Dr. Armin Tehrany put 6 anchors in my shoulder to fix 3 tears in my labrum, and now I’m having my best softball season ever. Thanks”, wrote Mr. Gertelman in his patient testimonial.